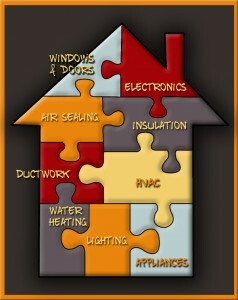 Why pay for a home energy audit? Getting a comprehensive, whole-house analysis will enable you to make the right improvements in the right order. A home energy audit is an important first step if you’re aiming to improve indoor comfort and air quality, while also reducing the amount of money spent on electricity and heating fuel. The energy audit itself won’t accomplish these goals, but it’s a critical first step. 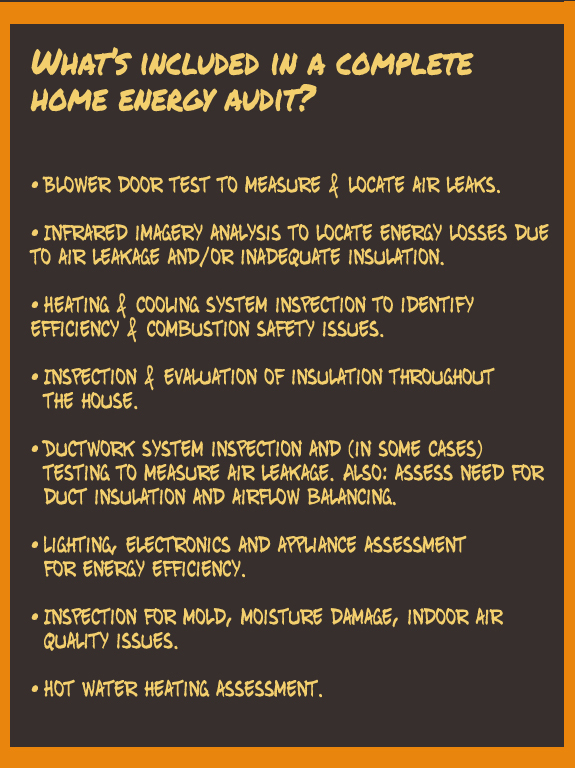 A complete energy audit provides you with a detailed home performance profile. You get a status report on how your house is using energy, along with recommendations for correcting deficiencies and optimizing home performance. First, let’s clear up some confusion about energy audits. One thing that’s confusing about home energy audits is that they’re often referred to by other names, like “home energy assessments” or “home energy checkups.” The confusion grows when homeowners realize that a home energy audit can cost anywhere from nothing to well over $200. The price discrepancy is due to several factors. For starters, rebates and other incentives are available in many areas to make low or no-cost energy audits available. Energy audits also vary in thoroughness. Some low-cost audits aren’t very thorough. The tests and inspections conducted don’t give a complete picture of your home’s energy performance. The “lite” version of an energy audit is sort of like having a car mechanic pop the hood of your car and listen to the engine rather than giving the vehicle a thorough going-over with high-tech diagnostic equipment that can pinpoint performance issues. One way to compare the energy audits available from different companies or organizations is to ask these providers if they perform the tests and diagnostic work listed in the sidebar above. The answers you get will give you a good indication of how complete the audit will be. For more detailed information about home energy audits (including an informative video), type the term into the search box at the ENERGY.GOV website. The “lite” version of an energy audit is sort of like having a car mechanic pop the hood of your car and listen to the engine rather than giving the vehicle a thorough going-over with high-tech diagnostic equipment that can pinpoint performance issues. With a master plan for energy savings, you’re protected from expensive “silver bullet” solutions. It’s not easy to do the right thing when you want your home to be more comfortable, less expensive to own and greener because of efficient energy use. The HVAC contractor will tell you that a new furnace or heat pump is the answer. Another contractor insists that what your house really needs is new windows and exterior doors. Despite the attractiveness of these “silver bullet” solutions, the truth is that basic (and less-expensive) “building envelope” improvements –like insulation and air-sealing upgrades—are usually given a higher priority because of their major impact on heating and cooling efficiency. Why spend $6000 on a new, high-efficiency furnace if the warm air you produce will continue to leak into the attic and out of the house? With a home energy audit, you know what improvements to make and what order they should have in your master plan for saving energy, improving comfort and lowering home ownership costs. Homeowners will want to known exactly what they should expect from the procedure, how long it will take, and what will be checked and tested. 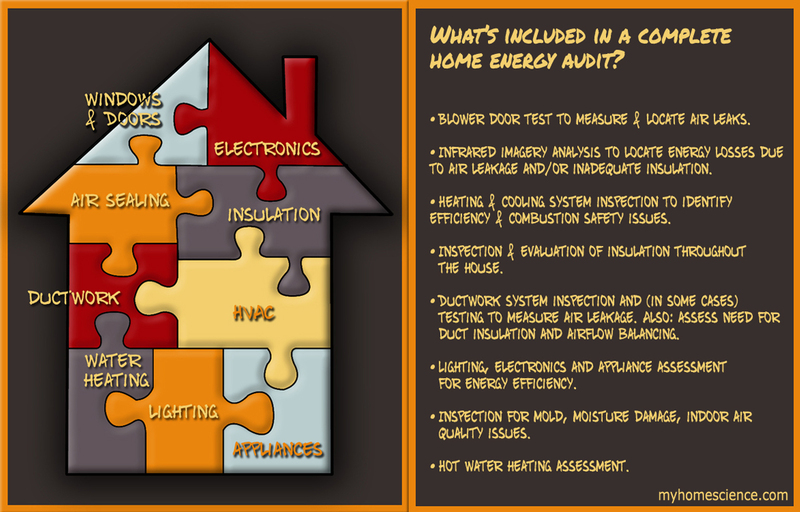 Many people have heard of energy audits or assessments, but may not be familiar with how the process works. Thanks for the feedback. One reason that energy audits are difficult to explain is that homeowners are accustomed to dealing with specialized contractors –painters, plumbers, electricians, HVAC guys, etc. An energy audit calls for a contractor with extensive knowledge about how different building systems function and interact. There’s a very good explanation of “Your house is a system” at the Building Performance Institute website (www.bpi.org), along with an explanation of what an energy auditor does.